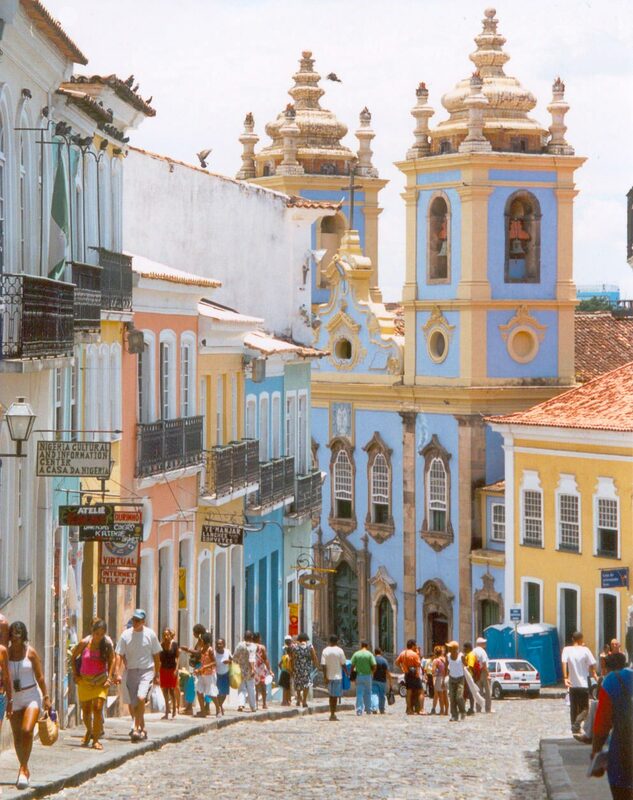 Pelourinho is the historical and cultural drawcard for tourists visiting Salvador da Bahia in Brazil. A lively epicentre of music, dance and restaurants, the area merits its prized holiday destination status. Tourists who visit the Mercado Modelo in Pelourinho might venture beneath this popular market into the slave chambers below and become aware of the tragic history of slavery that haunts the region. What many tourists might not know, however, is that the Pelourinho district underwent massive restoration efforts under the government during the 1970s and the 1990s. The area had become home to the poor and they were offered no more than a month’s wages or nothing at all to vacate and relocate. Studies show that of the 1300 families living in Pelourinho in 1992, only about 200 were able to remain in the neighbourhood (Collins, 2004:212). Those who have seen the changes can tell you how much the tourist development of Pelourinho affected the lives of the people that lived there. But even without a mastery of Portuguese, you don’t have to wander far off the pretty streets of Pelourinho to see a community in disarray. In my own travels, I encountered pregnant women high on drugs, old drunken men wielding screwdrivers as weapons and seven year olds with pocket-knives and guns. You only have to look at the long queue of tourists that line up daily at the tourist-police bureau to understand the amount of crime that plagues the region. Tourists are not being robbed by poor people that hate them, the tourists are being robbed by people who are indifferent to them. The local government has not stopped removing people from their homes in their bid to increase tourism. There are still attempts to forcefully move people out of the coast-dwelling shanty-towns in order to erect 5-star resorts and luxury wharfs. One of the communities that I worked with in the Alto da Sereia were actively involved in public actions to resist these attempts. There are people who care, but I have to admit that Brazil was the first place where I learnt that indifference really is the opposite of love. So many people have grown up learning to be indifferent to their situation as a psychological survival strategy against solastalgia. This culturally entrained indifference is the source of a lot of crime in Brazil. In my own country, Australia, I am starting to see the cultural entrainment of ‘indifference‘ taking place in another sphere of human concern that affects our homes and where we live. The New York Times has a fascinating article asking “Is there an ecological unconscious?” Starting off with a brief story about Australian researcher Glenn Albrecht who is Professor of Sustainability at Murdoch University, the article goes on to discuss ecopsychology which is the study of: “the interplay between human beings and their natural environment.” Albrecht‘s story struck me because the condition of solastalgia is as important to understand as nostalgia. I once thought that nostalgia was a section of the video store containing old movies, or at most a sentiment that old people felt for the “good ol’ days”, but when I read William Fiennes’ The Snow Geese while on my own travels of self-discovery in Europe, I learnt that nostalgia was a real neurological disturbance closely related to depression. From my earliest days at primary school in Australia, I can remember learning about pollution, the greenhouse effect, acid rain, global warming, climate change, the destruction of the rainforests, exploitation of marine life, overpopulation and poverty. And yet, today so many of my age group either seem numb to the topics or they simply have a jerk reflex whenever the issues are raised. Often the topic is changed all too easily. Daniel Smith’s article in the New Yort Times, however, has made me think that perhaps another process is at work. Perhaps there is an overwhelming solastalgia that we feel when discussing these topics that leads many of us to avoid the issues, ignore the problems and consciously overlook what we really need to be doing. The idea that the changes that we have begun are irreversible, (or at the very least the changes we have contributed to are irreversible), is an idea that is perhaps too much to bare and in an act of self-preservation, in a defense against overwhelming solastalgia, we have learnt to become indifferent. Daniel Smith’s article also gives me hope. Albrecht‘s most recent research is about Soliphilia: “the love of and responsibility for a place, bioregion, planet and the unity of interrelated interests within it.” Soliphilia is associated with positivity, interconnectedness and personal empowerment. If we can make our psychological defense against solastalgia into the positive manifestation of soliphilia, then we can definitely improve the interplay between human beings and their environment for generations to come. Yes, Paul loves a neologism, constantly pushing his readers’ vocabulary into an appreciation for the infinite generative possibilities within language. Much appreciated, even if it often leaves me confused. Interesting piece, Paul. I’ve been thinking about this, too, because I keep hearing the Generation Y is going to be more ecologically aware and environmentally activist than my generation (the early edge of Gen X). I just don’t see it. In fact, I’m more than a little mortified at environmental callousness demonstrated by young people frequently, especially if they face a choice between consumption and conservation. Your post has me thinking again about how we discuss huge problems, and if the effort to persuade holdouts in the environmental discussion that there IS a problem actually contributes to the demobilization of those who already care because we bombard the public indiscriminately with depressing images of the environment under assault. That is, if the messages meant to prod the indifferent can actually overwhelm those who are concerned, breeding greater insensitivity. Sometimes I wish politicians and leaders would do more to sell the positive, post-transformation vision of what conservation, higher efficiency, and simpler lifestyles could do for us in a positive sense — the cleaner, less stressful, simpler life as an inducement, rather than always the horror stories to frighten people into action. Thanks Greg! I hope readers of this post also read your remarks. I feel that you present a clear picture that is more succinct than my own. It would also be great if politicians, policy makers and public relations officers also take note of your positive and constructive comments! Disconnection from Nature in a fundamental way is the single cause of our present dilemma. Thanks for the link. I enjoyed this post and will read Smith’s article on Albrecht’s research. There are many times when I feel my own concern for the environment and the havoc we are causing is just to much to bear and yet I can not ubderstand why others seem totally unaware of what is going on. journalism. Bravo a thousand times! Not on topic per se, but something somewhat similar occurred in Albany in the course of the creation of the current Stalinist town square. Hello Paul, thanks for the great discussion of the key ideas in Daniel’s article. Just one thing or two. I have created the concept of ‘ecoparalysis’ to describe much of what concerns you. I will be putting this concept on my Blog shortly. Thank you for your kind and informative reply! Unfortunately I didn’t have a copy of The Snow Goose when I wrote this post as I borrowed it from a Professor many years ago. It was the perfect read at the perfect time. I still recall catching a train from Paris to Strasbourg while reading about Feines’ journeys by train to follow the migration of the Geese. Unfortunately, that four hour train journey I took is now a 1.5hour journey where the views pass by all too fast. you know, on re-reading the times article, i feel the story was hijacked by the New Age therapists in Northwest of USA, pure New Age gobbeldeegoo, the story should have focused just on Dr Glenn’s work, he is an activist a thinker. those shrinks are just shrinks. in the end, that article sucked. dan smith, you let us readers down. Greg Downey has given you a great lead – and I am pleased that you have taken note of it. I have the feeling that there is a growing recognition of the problems with the way environmental messages have been constructed and I agree with Greg that people need to find ways to promote the positive side of more sustainable living. As I mentioned in a recent post on Culture Matters, people are starting to realise that environmental discourse has been very good at stating what it’s against, but much less successful at promoting what it’s for. There is also a death’s head lurking behind much of the language about climate change — imagery of a burning planet and so on. People are reminded of decline, decay and death. Never mind if it’s objectively true or not, it’s language that produces a gut level sense of repulsion in many people. George Monbiot has recently tried to theorise the psychology of climate change. Interestingly he bases his argument on the work of an anthropologist, Ernst Becker, who argued back in the 70’s that a fear of death can produce various kinds of “immortality projects”, and even behaviours that hasten people towards the deaths that they so fear. And finally, I was just reading this post about the dangers of too much technology in the lives of kids. The arguments about the restorative powers of nature and the production of indifference through technology are very similar to the solastalgia ones. “Daniel Smith’s implicit assumption in the article seems to be that the move to a ever more industrialised, technological future is inevitable and desirable and unavoidable, but that somehow we can turn to psychology to game our way past the mental dis-ease that will increasingly overtake us as we over-develop and destroy our environment. I suspect he is wrong, and that there will be no way, other than a deep “green” future, to restore our deep mental health. It seems to me, for example, that there are different orders of “climate change denialism”, and that those who acknowledge climate change yet imagine that it is a problem that can be resolved through deploying new technologies are simply on a different part of the “denial” spectrum elsewhere occupied by those who refuse to acknowledge even the existence of human-induced climate change. I write as a one-time technological utopian,” he wrote. over it. we are headed to a place where ”Mad Max” meets ”The Road”. Prepare. Well, not now. Now is okay. Help future generations prepare, is what I mean. Danny, though I do appreciate your message. be hypercritcial once other people do all the creative work. I have no desire to debate or argue this point with you. call me James Lovelock’s Accidental Student for nothing. Sigh. I for one have a serious problem with the language of mental illness being used as a rhetorical battering ram in social issues in this fashion. In the (excellent) post above, you link to my blog and credit me for a quotation from Clive Thompson. Please fix the link so that it links directly to Clive Thompson’s article. highlight the climate depression is brilliant. separate them now and will remember both of them in the future.